Today I spent several hours aboard the Caribbean Princess. 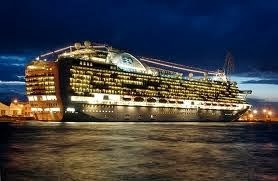 This ship is a sister ship to the Crown Princess and the Emerald Princess and my first time to set foot on her. My first impression as I approached her at the Houston Bayport Cruise Terminal was that at least from the exterior she was a fine looking vessel. I also observed that the security and check-in process was pretty well coordinated. There were some issue with the temporary Princes port help with what to do with visitors but for registered guests the process was pretty seamless. Because we were about thirty minutes late getting aboard most of the cabins were to examine were locked having been already cleaned for their guests who were already boarding. I did get a peek into a few cabins and will discuss them later. Right now, I want to mention the public areas. I was impressed with what the ship offered on the upper decks. Especially impressive was the adult only area on Deck 17. "The Sanctuary" is a quiet relaxing area for adults only. It has cabanas that can be rented and you can have Spa treatments there as well. It is complementary to SPA guests but will cost all others $10 for 4 hours and $20 for all day. The charge, so says Princess, is to limit the number of people in the space. It is much like the Royal Caribbean's cover charge for Johnny Rockets. which Princes has become known. Deck 18 is where you'll find the Walkway to the Skywalkers Night club. There are plenty of eating venues starting with the Island Dinning Room aft on deck 5 and Palm Dining Room forward on deck 6. Between these at Mid-ship is the Coral Dining Room. There are no large dining rooms as on some of the other cruise ships. I was fortunate to enjoy a meal in the Island Dining Room. Everything from the appetizer to the dessert and everything in-between was as good as I have on any cruise line. I don't think you'll be disappointed in the food. The wait staff is professional, affable and pleasant to be around. Passenger Cabin Decks (8-12) you can get a drink on each deck as you make your way to the Sanctuary on deck 17. Like all cruise ships there are whole sections of the ship given to merchandising. Deck seven at mid-ship has a plethora of Boutique shops. Small eateries that provide pastries for every sweet-tooth including a whole enclave devoted to Godiva Chocolates. The Grand Casino is not large by cruise ships standards and unlike most cruise ships is located forward on deck seven. It is clearly a smoking area. Even empty is reeks of cigarette smoke. There clearly is no air filtering system as we experience in the newer Las Vegas Casinos. One of the things for which I was not prepared was the number of children coming onboard. Princess is not particularly known as a family cruise line. In fact, many of my friends who sail Princess regularly do so because passengers are mostly adult. The cruise leaving the day I did the inspection (4/12/2014) had many very large family groups. The ship was launched in 2004 (it is ten years old) and had a renovation in November 2011, the work largely included an upgrade of the Art Gallery and Art Gallery Locker, retiling of pools, marble replacement, polishing of some public areas, refurbishment of interior hardwood floors in several lounges and glass replacement in some public areas. As indicated these areas shine. All of the above will contribute to a great cruise vacation. Based on the amenities, public area, cuisine and staff I would not hesitate to book a vacation on the Caribbean Princess. The ship is in need of similar attention being given to the passenger cabins. As I mentioned above I did not get to see many of the cabins but I did see enough to notice that whether it was a suite or an inside cabin the ones I did see were smaller than I expected and they had what at best can be described as a "tired" look. The cabin amenities were, as a friend of mine often says, "adequate." They were not exceptional. Needless to say I was disappointed. I did like the roomy closets. Lastly, a word about the staff in general. I do not think a single staff member that I encountered failed to great me with a pleasant greeting in very good English (Except the one waiter who kept referring to me as señor). Personally, I am eagerly awaiting the arrival of the Emerald Princess launched in 2007 and renovated in 2012. We do have some space on the Emerald Princess. Keep in mind that if Princess offers a better price than our group price we can still book you into the group at the lower of the prices. Check it out at our Facebook Event Page. Please visit our Texas Cruise and Travel Facebook page and like us.